Probably the most important metal detecting accessory is without doubt something decent to dig with. Most beginners to the hobby start of with the old faithful garden trowel, been sitting unused in the shed for years and lasting about 10 minutes before snapping when used for metal detecting. You may have read in magazines and books that you can go detecting with a small trowel or even a screwdriver. This just proves that the sort of people who write in books and magazines rarely go detecting. The two home made examples above show what can be produced for about £20.00 maximum, plus about 30 minutes work. Such diggers can be purchased ready made from specialist detector shops but you will expected to pay anything up to £45.00. 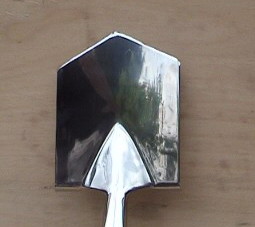 The spade shown above is a Wilkinson Sword Stainless steel edging spade. 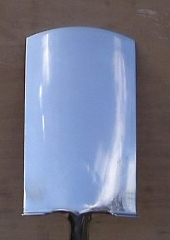 The blade is about 145mm wide and is Guaranteed for life it says on the label. This was purchased from a large DIY store for just under £20.00. 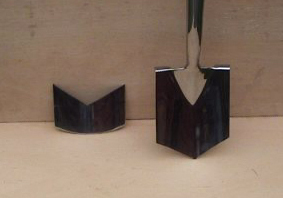 A spade with a normal mild steel blade can be purchased for less than £10.00. 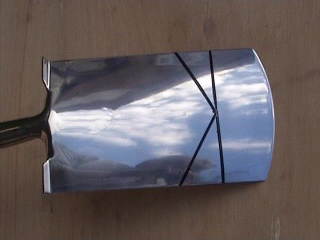 The standard blade is too long and too blunt for metal detecting and needs to be shortened and given a point. Mark the blade with a black marker pen. From footrest to tip needs to be about 180mm. You need to hold the blade securely in some sort of vice and use a good hacksaw with a new blade. 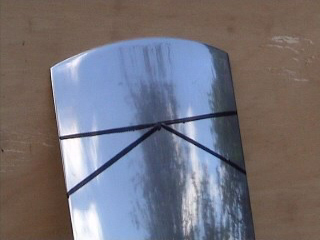 Stainless steel is a very tough metal to cut, but the two cuts should only take about 10 minutes. 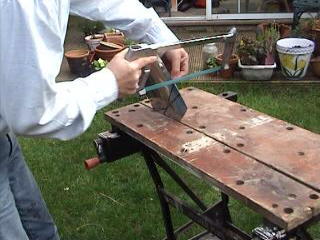 Once the cuts have been made you will have to sharpen the leading edge with a hand file or electric grinder. 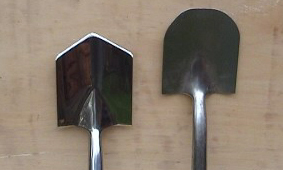 Two examples of home made diggers, the actual shape is up to you. This type of digging tool is virtually unbreakable, and can be used to advantage for farmland or beach work. A small garden trowel will give you blisters in no time. It will make your knees and back ache, and will snap after a short while.